Hola y un saludo a todos!! I have been asked a number of times by people who wish to walk the Camino if they need to learn or understand the Spanish language beforehand. Hopefully, this post will lend a hand. On my first trip in 2011, the only knowledge of the language I had was from back in secondary school. I could barely say hello and goodbye, let alone ask for the time or ask for directions. So when I was in Spain, I felt I was missing out on something. One of the guys I was walking with was a language teacher and I was reliant on her when I was out and about. So when I came back from that Camino, I promised myself I would start to learn the language. Now compared to any other language, Spanish is relatively easy. It is one of the most widely spoken languages also; most of South America speak it and you will almost certainly find someone in the States who knows a word or two. I wanted to learn it for the Camino however, not to travel to those countries. That said, you can get by without knowing a word. The Camino is like a microcosm of the world in general. People from all countries do their best to communicate in their own languages, and it’s often difficult to understand each other. Most people choose to speak in “simple English” and if you are walking for 30 days, you “could” return home with your friends and family finding it hard to understand you!! 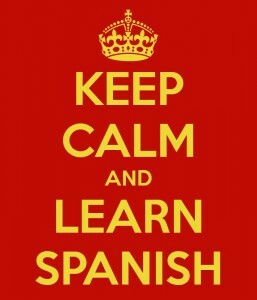 So at the start of 2012, I signed up to do an evening course in basic Spanish. It is one option available to you should you wish to delve in. I got to learn the simple stuff, without learning grammar, verbs or getting into conversations. I was fairly happy at the end of the ten weeks so I signed up for the conversational level Spanish. Now I found this a little tougher. The whole premise of this course was to immerse you in the language. No English was allowed and we were kind of made to make mistakes in Spanish no matter how bad they were. It was tough going but I came out with alot more knowledge than I had. Fast forward to now…I can understand a Spanish conversation and can speak but at a slow enough speed. I am delighted I made the decision to learn. It is sad that most people in Ireland only speak one language, but if you go to Spain, they speak three or Holland, they speak four. Duolingo.com – You can sign up for free and learn from scratch. The userface is very attractive and there are great incentives that make you come back each day. I’m currently topping up my Spanish there, whilst re-learning Irish. Lightspeed Spanish – Another fabulous website that offers tutorials for all levels, from absolute beginners to advanced speakers. Gordon and Cynthia provide podcasts and YouTube videos and last year published a book which I have bought “Victor’s Adventures in Spain”. Mi Vida Loca – Not so much geared to those walking the Camino but a great place to start out if you want to learn Spanish. “My crazy life” is an online drama that includes you. It is fully interactive and gives you great vocabulary. I still go back to it to refresh. Camino Lingo – I don’t own this book, but it has been recommended on the Camino Forum. A basic, all-you-need book providing vocabulary to use while on the Camino. There are also many many websites that send you daily emails with vocab and phrases. They certainly help. Buen Camino, peregrinos y buena suerte! Great list of reasons and resources there David, I only knew about the Duolingo but will be looking into the others – and have bought Sillydoll’s Camino Lingo for my September walk too. Cheers!